Lately I've been daydreaming about a new car, however I refuse to get a new one until my current one dies. Who knows when that will be...she's 17yrs old and still drives as great as the day I got her, despite her poor cosmetic appearance. When that day comes, I'm dying to have a station wagon. Call me crazy, but I think they're cool and of course you can haul things like tons of antiques!!! When I finally get that station wagon, I think I'll take a great road trip and take in all the kooky roadside attractions along the way. After all those years flying, it's time to start driving! 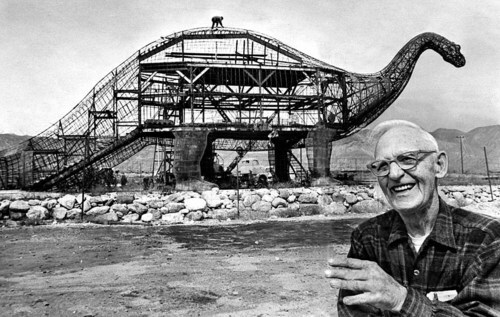 Claude Bell's Dinosaurs are #1 on my list of places to visit.